US Dollar: March USD is Up at 96.580. 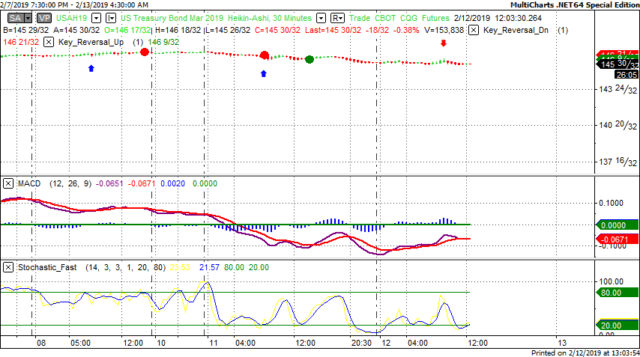 Energies: March '19 Crude is Up at 53.70. Financials: The Mar 30 year bond is Up 3 ticks and trading at 146.02. 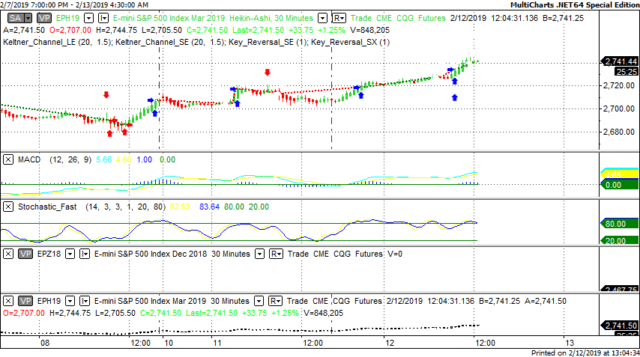 Indices: The Mar S&P 500 emini ES contract is 10 ticks Higher and trading at 2747.25. Gold: The Feb Gold contract is trading Up at 1316.40. Gold is 24 ticks Higher than its close. This is not a correlated market. The dollar is Up+ and Crude is Up+ which is not normal and the 30 year Bond is trading Higher as well. The Financials should always correlate with the US dollar such that if the dollar is lower then bonds should follow and vice-versa. The S&P is Higher and Crude is trading Higher which is not correlated. Gold is trading Higher which is not correlated with the US dollar trading Higher. I tend to believe that Gold has an inverse relationship with the US Dollar as when the US Dollar is down, Gold tends to rise in value and vice-versa. Think of it as a seesaw, when one is up the other should be down. I point this out to you to make you aware that when we don't have a correlated market, it means something is wrong. As traders you need to be aware of this and proceed with your eyes wide open. At this hour all of Asia is trading Higher with the exception of the Indian Sensex exchange. Currently Europe is trading Higher with the exception of the Spanish IBEX exchange which is fractionally Lower. CPI is out at 8:30 AM EST. This is major. Core CPI is out at 8:30 AM EST. This is major. Federal Budget Balance is out at 2 PM. This is major. Yesterday we gave the markets a Neutral bias as the USD was trading Higher yesterday morning but should have been trading Lower. The Dow gained 373 points and the other indices reached higher ground as well. Today we aren't dealing with a correlated market and our bias is to the Downside.